The Nextbase 612GW 4k carries a serious price tag at an RRP of £249.99. The first to offer an ultra HD 4k screen, the video quality is unlike any other, even in rainy conditions, so for some it’s a small price to pay. With Wi-Fi link for quick playback, an anti-glare polarising lens, and the latest Sony EXMOR R sensor, this is one of the most comprehensive dash cams available. To take full advantage of the 4k you’ll need the Nextbase 64GB Micro SD Card and adapter, which isn’t included with the dashboard camera itself. 64GB is really the minimum you can use to record a decent amount of footage, as 4k takes up a huge amount of space. This memory card ensures what your recordings can be downloaded in the full 4k quality it was filmed in. It has a read speed of 35MB/s and a write speed of 50MB/s, giving you super smooth video. The 3-inch touch screen gives you control of a full menu of features. The icons are clear and it’s sensitive and easy to tap and go. If you’re driving, you can use voice commands to start and stop recording, and it displays your speed as a screensaver. There are so many features that make this a top of the line dashboard camera – including clarity of recording, file protection, an intelligent parking mode that automatically records your manoeuvres, an auto-dimming screen and even the mount is sturdy, decent quality. So what’s the 612GW spec like? With a 150-degree wide-angle field of vision, more of the road can be captured than ever before. That’s 10 degrees wider than the 412GW too. Many find wide-angles can be impractical because it doesn’t focus well enough on details like registration plates, but with such a high-definition resolution, you’ll be able to capture closer detail and view more of the road at the same time. Inbuilt Wi-Fi means you can download footage quickly to your phone or tablet and rewatch – ideal for long journeys or if you’re far from home. Compatible with both iOS and Android devices, you can also download to a PC or Mac and easily edit video footage using the brand new Replay 3 software. Watch your footage back on a quality screen. While you’re driving, the screensaver shows your speed, and while you’re still you can use the sensitive touchscreen to manage your device. This is “the world’s first 35mm full-frame stacked image sensor with integral memory”, according to Sony. It guarantees the same professional shots as an SLR camera in an even smaller space. Set off immediately with no messing around thanks to the Click & Go mount. Its magnetic click means you can attach the dash cam one-handed, move it with no hassle to download footage, and charge your device through the USB port in the mount. Get a full picture of your journeys. The GPS records your location and speed, allowing you to view historical journeys on a map as well as record the road. Start and stop a recording whenever you want without distracting yourself from the road. This filter removes the glare and reflection of your windscreen, ideal when the sun is low during winter months or weather conditions make visibility poor. Removing reflections and marks will make your HD footage even clearer. 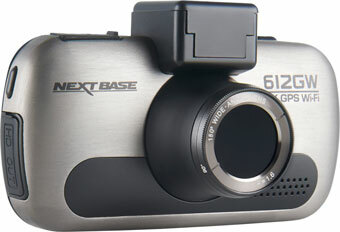 What’s the Nextbase 612GW like? A dash cam is really put to the test when conditions are bad. So far, at night, in heavy rain, and even snow and fog, the 4k high definition and anti-glare has really made the difference to playback. Registrations are still unavoidably tricky to read in the dark, however. If you don’t have a 4k device or TV, you won’t be able to fully appreciate the clarity of the footage you record, but you’ll still be able to watch in 1080p high definition. For this reason, the 612GW could be a lavish purchase if you won’t be watching it back on a device of equivalent quality. There are also cams out there that record more than 150-degrees – some even record 360-degrees – so if you want to capture three or four lanes of traffic, the 612GW won’t be enough. When there’s impact, the 612GW has in-built file protection which will record 10 seconds pre-collision, 30 seconds during, and 20 seconds after. It turns on automatically when you’re parking, recording motion and recording for 30 seconds. British users will find that the memory stick port is on the slightly impractical left-hand side - not as accessible as it would be for US or European drivers. This is nit-picking though, overall it’s easy to use and its many features function brilliantly together. This dash cam offers you pretty much all the protection you could ever want when recording the roads. Should I buy a 612GW dash cam? If you’ve got the budget for it, or you’ve found cheaper models haven’t quite done what you want them to, the Nextbase 612GW is one to go for. The 4k is only a selling point if you’re really conscious of recording in the highest quality available, and have an appropriate device for playback. The other features are super intelligent though, and will have dash cam enthusiasts very keen to get their hands on one. Regardless, this is a great purchase and will provide you some of the best protection in case of an accident. The ability to provide your insurance company with some of the clearest detail available might be able to persuade you to take the plunge.